The Thompson-Nicola region offers both world class river and lake fishing for trout and salmon. Its hundreds of lakes produce quality stocked rainbow trout and brook trout fishing, while the Thompson River, Adams River and other Shuswap tributaries produce seasonal salmon as well as trout that feed on their eggs. This is truly a fishing paradise throughout most of the year. Due to the dry condition in the summer months, this is the ideal destination where you can combine camping and fishing in your trips. Although most of the fishing occurs in the summer, ice fishing is available at some lakes too. From ice-off around late April/early May, lakes around Merritt and Kamloops offer some of the best trout and char fishing in the world. Pennask rainbow trout, known for their aggressive takes and multiple jumps, are stocked in many lakes. These fish are released either at the fingerling or yearling stage. They spend one or two years to reach the target size. Due to the richness of nutrients in these lakes, fish grow rapidly once released. 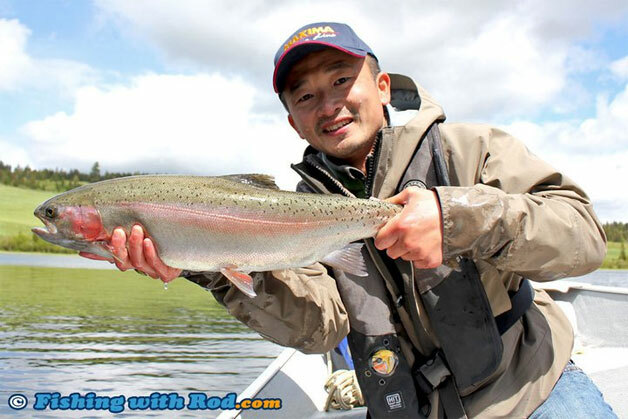 Rainbow trout between 2 and 5lb are common, while bigger fish up to 10lb are not unheard of. Some popular lakes that are worth visiting include Tunkwa and Leighton Lakes in Tunkwa Lake Provincial Park, Lac Le Jeune just south of Kamloops, Roche Lake in Roche Lake Provincial Park, lakes in the Kane Valley, Alleyne and Kentucky Lake in Kentucky Alleyne Provincial Park, Lundbom and Marquart Lake just outside of Merritt. All of these lakes have good vehicle access and overnight campsites, making them the ideal destination for families who enjoy both fishing and camping. If popular lakes are not your style, then remote lakes which require some exploring are for you. These smaller lakes, which also offer excellent trout fishing, can be found by browsing through the stocking history on fisheries' websites. They require a reliable vehicle that can withstand the rugged terrain. Once you arrive, you can enjoy solitude as well as big catches. A boat is required for fishing at lakes in the Thompson-Nicola region. Most popular lakes have resorts where boat rental is available. Because it can get very windy in this region, anchors are a must if you are fishing from a boat. While you can simply troll and hope for a fish to bite your lure, fly fishing is a much more effective way to catch these trout because they are primarily insect feeders. Chirinomid fishing is a popular style of fly fishing, which involves suspending a nymph under an indicator during a hatch. If the size and colour of your fly match whatever it is hatching and it is placed at the right depth, then you can have fantastic trout fishing all day long. Brook trout is another species found in many lakes in Region 3. A non-native species in British Columbia, these fish are stocked in selected lakes by Freshwater Fisheries Society of BC. They are also stocked at the fingerling or yearling stage. Sterile, these fish utilize all of their energy on growth so they can also become trophy-sized fish in a short span of time. While trout fishing in Region Three lakes mostly takes place between spring and fall, ice fishing is also available from January to March. Beside being able to catch healthy big trout, Ice fishing can be a great social gathering. A fire can keep anglers warm when the fish are not biting, but that is often not needed. River fishing in Thompson-Nicola usually starts in July until late fall. In July and August, rainbow trout feed aggressively during the evening hatches. Thompson River, a large tributary of the mid Fraser River, is the ideal walk and wade river where you can encounter dozens of rainbow trout on a dry fly each day. Rainbow trout in this river are mostly between 1 and 2lb, but fish up to 5lb are not unheard of. In late summer and early fall, chinook and sockeye salmon return to the Thompson River and other Shuswap tributaries to spawn. Chinook salmon fishing openings are usually available while sockeye salmon openings are granted at times if escapement numbers are met. While salmon fishing can be good, trout fishing can be sensational during this time of the year. Rainbow trout and bull trout can be found staging behind spawning salmon, feeding on deposited eggs drifting away from redds. By using an egg pattern, anglers can find themselves holding onto the rod, battling with the strongest trout in the world at the end of their lines. Thompson River steelhead fishery typically opens in October until the end of November. Unfortunately, recent years' low returns have kept this fishery closed at times. Openings are usually announced in-season once biologists determine their returning numbers. To go fishing in Thompson-Nicola, you need a valid basic freshwater fishing licence. Conservation surcharges and classified licences are also needed at times for certain fisheries, such as Thompson River's salmon and steelhead fisheries. Thompson River, Adams River are just two of many rivers where trout, salmon and steelhead fishing are available in Thompson-Nicola. From mid summer to early fall, anglers can experience fantastic dry fly fishing for rainbow trout while salmon fishing usually starts from late summer to mid fall. Find out where you can camp and wade in some of the best trout streams in BC. Thompson-Nicola has dozens of lakes to choose from for fly fishing in spring and summer, ice fishing in winter. Either rainbow trout or brook trout, or both, are available in these lakes. Some lakes are day-use only, while overnight campsites are available at others. A boat is required if you want to do well at these productive lakes.